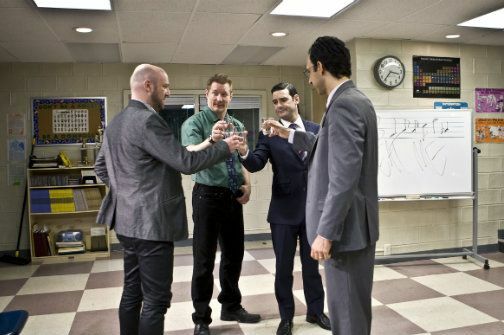 Matthew Maher, Bill Dawes, Mather Zickel, and Amir Arison in The Muscles in Our Toes. Photo by Monique Carboni. BOTTOM LINE: A bewildering satire by Stephen Belber, featuring some spirited performances. The incredibly prolific Stephen Belber has a new play off Broadway, The Muscles in Our Toes, which has extended its run at the Labyrinth Theater’s space on Bank Street through July 19th. And while there are familiar elements in this new piece -- an exceedingly high rate of testosterone, for one, as well as characters with long-held secrets that explode in each others' faces -- fans of the playwright’s better-known works may find themselves in an unrecognizable world of absurd satire. It’s uneasy territory for Belber, although it does provide moments in which his cast, directed by the award-winning Anne Kauffman, can gleefully cut loose. Of Belber’s ten or so plays with which I’m familiar, the closest that has approached satire was McReele, a 2005 Roundabout Theatre drama that starred Anthony Mackie as a convict who charms his way out of a prison cell and into a political career. Unfortunately, what that play most shares with the new one are somewhat confusing ideas and characters with impulses that don’t always feel organic. Belber’s best works, in contrast, such as the intensely dramatic Geometry of Fire and Tape, are tautly written, beautifully constructed affairs. In The Muscles in Our Toes, four friends gather in their old high school choir room, while a dreary 25th class reunion takes place downstairs. Many things have changed since they last gathered, and some of the characters are looking back wistfully on days gone by, when they had higher, dreamier expectations of themselves. However, there are also things that have not changed, such as long-unresolved, complicated feelings, which are pulled to the surface by the evening’s inciting incident: A fifth member of their old circle, who has become a millionaire tennis shoe mogul over the years, has been recently reported missing, the kidnap victim of a band of Central African terrorists. The ride for the audience gets a bit bumpy fairly early in these proceedings, as the four concoct ludicrous schemes to somehow rescue this friend. Alliances within our small, fraught group of sad men rise and fall, sometimes out of nowhere. The ideas they ponder are, to say the least, wildly ill-advised. And, while there are potentially interesting fault lines embedded in the script -- particularly Muslim/Jew, but also gay/straight, male/female, art/commerce, etc. -- none are explored in fresh ways. It’s possible that part of this is Belber processing, through a farcical lens, some of his own mixed feelings as a man looking back on his youth from the halfway point (added with that, a look at contemporary race relations). There are hints that his characters are native to the Washington, D.C. area, as is he. And their graduation date was only a few years later than his own, although many of their music references -- Howard Jones, the Honeydrippers, “We Are the World” -- are notably more aligned with his own years in high school. But, regardless of his inspiration, what Muscles in Our Toes most lacks is a clearer understanding of why these friend/foes share such a profound bond that they would risk, with relative ease, their lives, limbs, and careers for each other. He hints at the answer. The title, for instance, comes from an impassioned loyalty oath long ago declared by one of them, in which they would, in an hour of need, hurtle forward “with every particle of our body, from the tips of our brain to the muscles in our toes.” But Belber never fully persuades us that this is so. As a result, the action and the crazy humor of the play both lack a central engine. The actors seem to be having fun, nevertheless, even slightly improvising here and there. The Obie-winning Matthew Maher, as usual, electrifies the play as soon as he appears. An actor who specializes in tightly wound, bug-eyed outsiders, Maher has a wonderful ability to draw explosive laughs from a variety of lines, from the seemingly banal “How’s your wife?” to more elaborate ripostes like, "It's called an IED. An I-U-D is a whole different kettle of fish." Jeanine Serralles, as a drunken female classmate who seems to share various shades of sexual history with them all, similarly invigorates the stage. Both are directed by Kauffman in broadly hilarious strokes, whereas Bill Dawes makes an equally strong impression with a performance that better matches Lee Savage’s excellent set design, Japhy Weideman’s lighting, Emily Rebholz’s costumes, and Jessica Paz’s sound: all grounded in solidly impressive, realistic detail. David Anzuelo’s fight choreography, too, is effectively tense and believable and brings a jolt to the production that is similar in voltage to Maher’s first entrance. The director does what she can, both with the inconsistent demands of the script -- satiric laughs one moment, sincere confrontations another -- as well as with the difficult playing space, in which she finds dynamic angles to play the actors off each other, despite the audience surrounding the space on two sides, in an L-shape, and a pesky pillar that blocks a sizable section of the upstage area from view.